In 2000, an anonymous eBay seller listed a painting created by artist Bill Stoneham called "The Hands Resist Him." This painting is now largely considered to be one of the world's most haunted works of art. 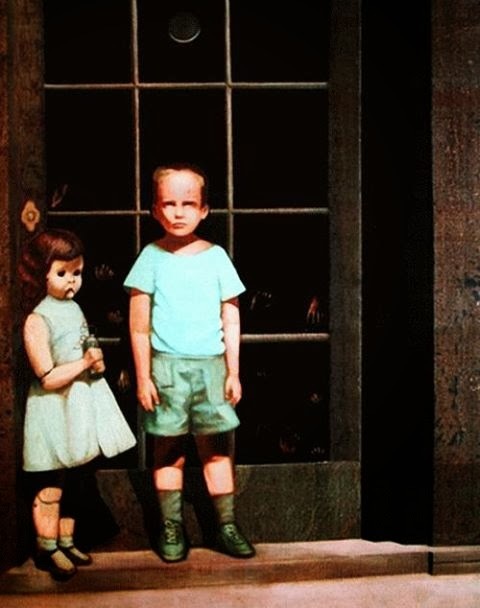 The painting features a boy and a creepy doll standing in front of a glass door. The painting was created in 1972 and purchased by Hollywood actor John Marley. It was then bought by a California couple before going up for sale on eBay along with a dire warning about the problems involved with owning the object. According to the couple, the figures in the painting moved around at night, sometimes disappearing from the canvas entirely. The boy in the painting was said to actually enter the room where the painting hung, and everyone who viewed the painting reported feeling sick and weak. Small children would take one look at the painting and run from the room screaming. Adults sometimes felt like unseen hands were grabbing them, and others said that they felt a blast of hot air, as if they had opened an oven. Even those who viewed the painting on-line claimed to feel a sense of unease, dread, or terror when looking at the painting. One person even claimed that their brand new printer refused to print the photo of the painting, however it worked fine on every other print job. The painting was purchased by an art gallery in Grand Rapids, MI. When the gallery spoke to the artist who had created it, he was surprised to hear that his work was at the centre of a paranormal investigation, but he did mention that two people who originally displayed and reviewed the painting had died within a year of viewing "The Hands Resist Him."